The board of directors of the Brethren Missionary Herald Company met this week, welcoming two new members who were recently elected to serve on the board. Joining the meetings for the first time as official members of the board were Bill Gordon, Warsaw, Ind., a member of the Winona Lake (Ind.) Grace Brethren Church, and Dave Collins, Ripon, Calif., a member of the Grace Brethren Church there. 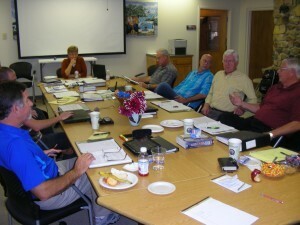 Meeting on Wednesday and Thursday, October 24 and 25, the board approved an operating budget for 2013, learned about social media during a panel discussion, and planned for the future of the organization as it moves further into its 7th decade as the communications arm of the Fellowship of Grace Brethren Churches. Barb Wooler, Warsaw, Ind., presided over the meetings and was re-elected as president for the coming year. Other officers who were elected included vice president: Tim Sprankle, Warsaw, Ind. ; secretary, Bob Arenobine, Fort Wayne, Ind. ; treasurer: Bruce Barlow, Winona Lake, Ind. ; and member-at-large: Rick Fairman, Lititz, Pa. Other board members include John Rowe, Ashland, Ohio; and Daron Butler, Wooster, Ohio, in addition to Gordon and Collins.